We have been in our new house for a month now and at last I am starting to get through some of the decorating and DIY that is required when moving in. With less than 5 weeks to go before "baby HTS" will be with us you can imagine the QTH is undergoing a serious facelift with the smell of paint becoming the normal everyday occurrence. Over the last couple of weeks I have managed to temporally install 3 antennas allowing me to operate on HF and also hear local activity on VHF. 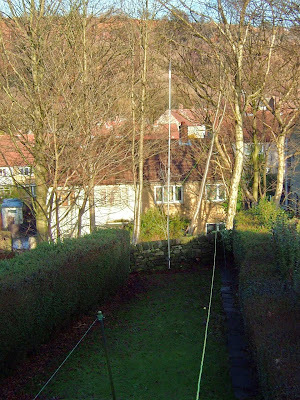 The 3 antennas that I have erected for now, are a 135ft dipole with ladder feeder for 80m, a Hustler 6BTV (6 band trapped vertical) 80-10m and a tri-band vertical covering 50MHz, 145MHz and 433MHz. As of yet the satellite antennas and new GS5500 azimuth/ele rotator set-up, is still collecting dust as a nice long ladder or scaffold tower will be required to go ahead with the satellite install. 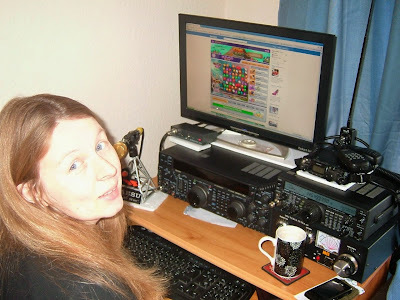 For now working the Sats will have to be when I am at my Portable shack on the Moor. As you can see in the background of the image below which shows the 6BTV, the Moor is less than a mile away as the new QTH is situated on the edge of the lovely moorland. The Hustler 6BTV HF Vertical antenna is ground mounted in the same way as my other 6BTV at the now portable shack. Here at the new garden The SWR is 1.1 without the ATU from 40m right through to 10M. 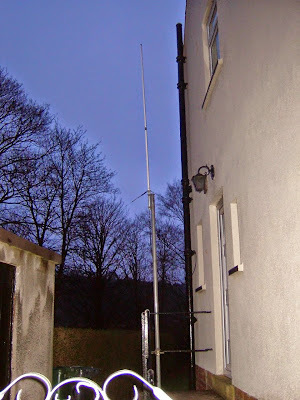 The vertical tunes 80m up well with the ATU in line and has a very low noise level on receive. So far I have worked across the pond to the US on it with ease, I also heard some nice VK and ZL signals coming very well, as well as hearing signals out of HS land. 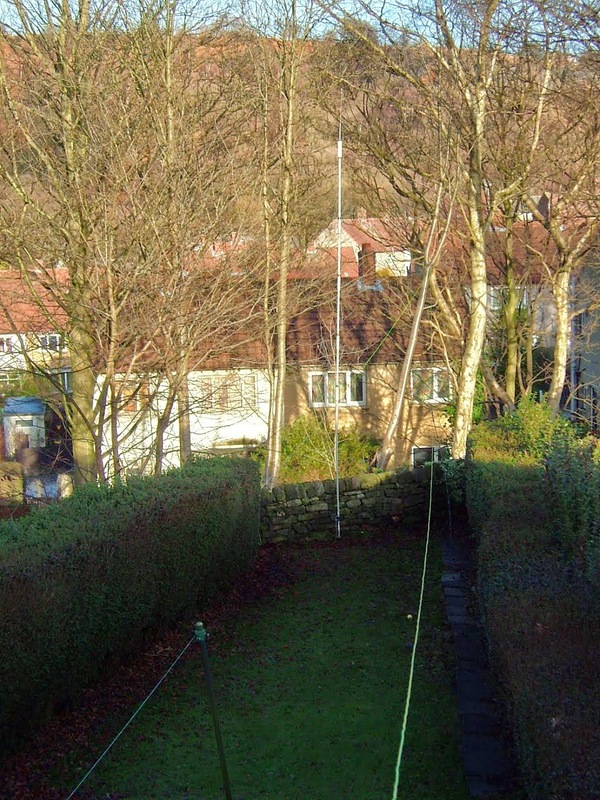 The tri-band antenna works reasonable in its very temporary position but I am sure it will be greatly improved once it is up high on the top of the house. Louise will also be a bit happier hi hi. I dont know what she means when she says "it looks stupid there" Lou knows it wont be there for long! 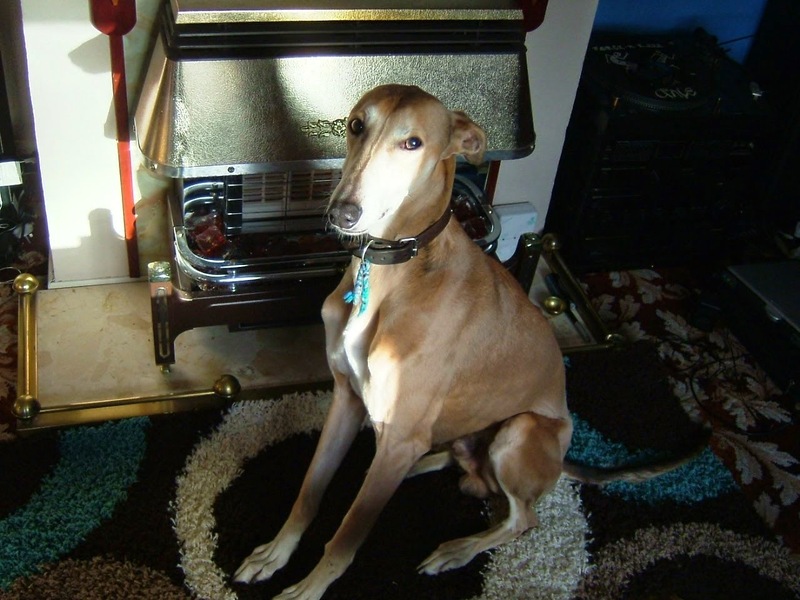 For those of you that were wondering about Dudley the DX Hound, here Dudley can be seen getting himself acquainted with the living room carpet which lets face it looks like a great spot to catch some Zs if your a four legged type. 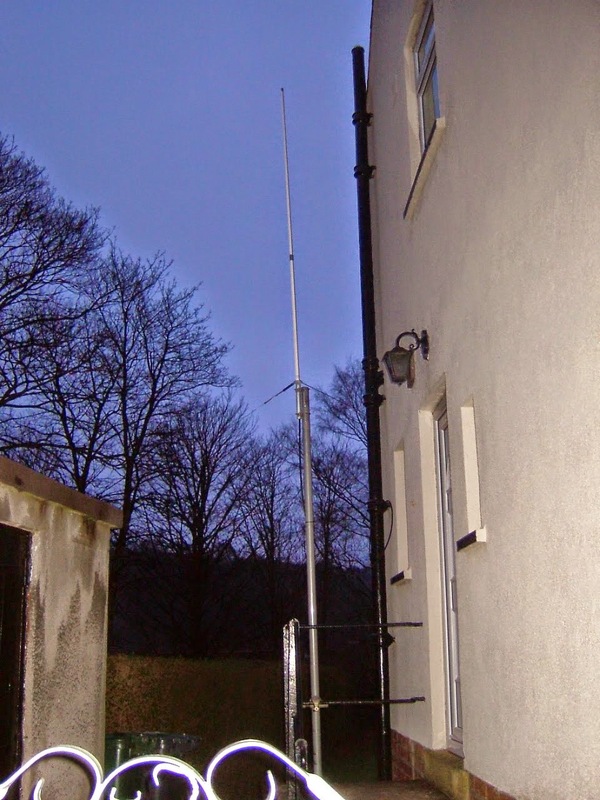 The HTS family is settling in very well indeed, however if the decorating gets a bit much a quick drive up the road takes us back to the Moor Top Holiday Shack where my other Hustler Vertical, CW160, Delta loop, IO-10 Sat beam and Rigs are awaiting me. 73 hope to catch you from the new QTH or portable Shack on the hill. Next months (February) RadCom magazine arrived earlier this week courtesy of the RSGB. 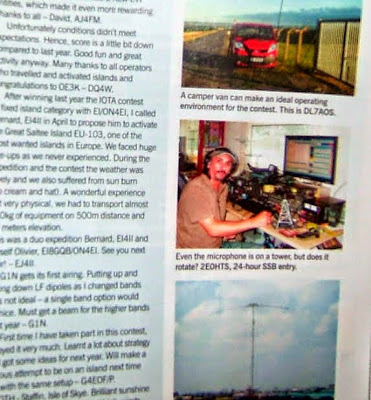 Inside the radio magazine I found myself appearing in the IOTA 2010 article which was a very nice surprise indeed. 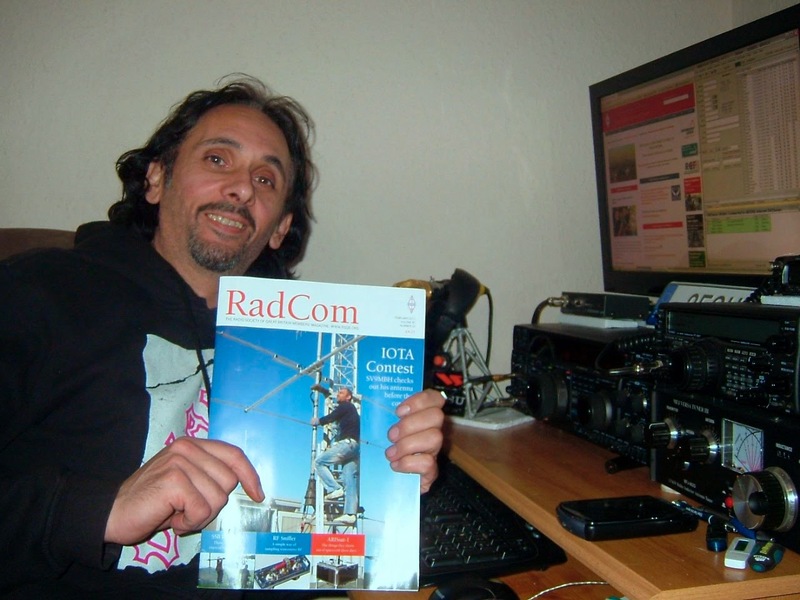 The picture inside RadCom shows myself in action during the IOTA 2010 contest which I enjoyed very much. The picture was taken at my Moor Top shack which is now my portable location as I have recently set up a second shack at our new family home. You can see my new table which is housing the FT1000mp and FT847 on the image above. The image below shows the page in Radcom where you can find 2E0HTS - IOTA Contest Station on page 26. The editor of the RadCom magazine has commented on my home made microphone mini tower which reads "Even the microphone is on a tower, but does it rotate?" But you never know what I might get up to in my workshop next time I'm tinkering around! CQD was the international distress code that predated SOS. It celebrates its 107th birthday today as on January the 7th 1904 it was established by the Marconi Company as the first international radio distress signal. CQD is transmitted in Morse Code as — · — · — — · — — · · and although it is widely believed to be an acronym for ‘Come Quick Danger’ that is not the case. It is a general CQ call followed by D meaning distress. Before CQD was established ships would just go missing at sea, when radios were introduced onto ships they initially used CQ as a general call, however the introduction of a distress signal was widely accepted to be a good idea. Sadly CQD was short-lived as it was replaced by “SOS” at the Berlin Radiotelegraphic Conference of 1906 as three dots, three dashes and three dots could not be misinterpreted by anyone hearing it unlike CQD . Still, happy birthday to CQD a ground-breaking use of Morse Code and radio, the introduction of which no doubt saved lives. Hi All, I trust you are all having a great start to the New Year so far! For myself this has been a very busy time. We have moved into our new QTH that I mentioned a few posts back. So far the progress with the decorating is going well and I have temporarily installed a Hustler 6BTV and 135 foot Dipole allowing me to monitor HF in between the brush strokes and paper hanging. Louise (M3TLL) has also been busy propagating the baby which will be arriving in around 8 weeks time. I will be shortly posting pictures of my new QTH/Shack, but for now this is a quick update and opportunity to say Happy New Year to you all and I shall be back online at the new QTH as soon as the new internet connection is switched back on. 73 watch this space for more info on the latest escapades.